2009 was a banner year for anyone interested in the 16th President of the United States, and especially for those who collect coins. The four newly designed 2009 Lincoln Cents and the two Bicentennial Lincoln Silver Dollars were huge hits. 2010 promises to be exciting as well for collectors with the new 2010 Lincoln cent expected to be released within several weeks and the 2010 Lincoln Presidential $1 Coin set for launch in November. Another unique item available from the United States Mint right now is the Abraham Lincoln Bronze Medal. The tradition of producing these “Indian Peace Medals” continued until 1869, when the term used to describe them changed to Presidential Medals. The obverse continued to bear a portrait of the current president, but the reverse no longer carried symbols of peace and friendship. The heads side of the current medal honoring Abraham Lincoln features his image with "ABRAHAM" to the left, and "LINCOLN" to the right. The reverse, originally designed by George T. Morgan, contains a wreath of oak and laurel within a pearled ring. Reverse inscriptions include: “INAUGURATED PRESIDENT OF THE UNITED STATES MARCH 4, 1861”, “SECOND TERM MARCH 4, 1865”, “ASSASSINATED APRIL 14, 1865.” Inside the wreath is the Egyptian symbol of eternity and immortality, a serpent with its tail in its mouth. 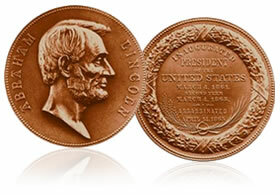 The Lincoln medals may also be purchased by calling the US Mint’s toll-free number, 1-800-USA-MINT (872-6468). The United States Mint, created by Congress in 1792, is the Nation’s sole manufacturer of legal tender coinage. Its primary mission is to produce an adequate volume of circulating coinage for the Nation to conduct its trade and commerce. The United States Mint also produces proof, uncirculated, and commemorative coins; Congressional Gold Medals; and gold, silver and platinum bullion coins. How does one date a Lincoln bronze medal. I have the exact same medal as above, but it belonged to my great grandfather. I remember seeing at my grandmother’s house in in the 1940’s so it clearly is not from this new batch. but it is EXACTLY the same. Good point. I have one which my father purchased over twenty-five years ago. I would also like to know its actual age.